When your contacts don't respond to a message in a flow, you can add a timeout to send an automatic message. This feature allows you remind your contacts to respond, to let them know they can restart the flow at a later time, or to place other actions on non-responsive contacts, such as adding or removing them in a group, sending an email, and more. 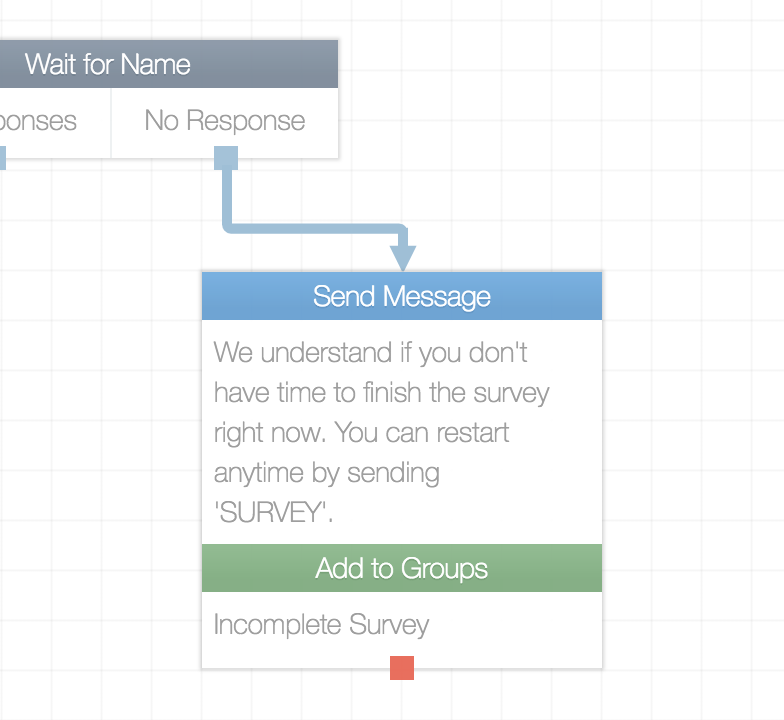 In the example below, we gave our contacts 1 hour to answer the first question in our flow. If the contact responds within 1 hour, they will receive the next message in our flow immediately. If they do not respond within 1 hour, we can send them a 'No Response' message. In this example, we want to let our contacts know that they can restart the flow later by sending the keyword trigger we've assigned to the flow. We've also added these contacts to a group we've created called 'Incomplete Survey', which allows us to easily see which contacts still need to take the survey. Questions? Send us a message via the support widget in the bottom right corner.